I sell my cowhorn according to their length. The shortest are cheapest, but most difficult to play. The long ones are more expensive, but more easy to play. Goathorn are harder to get and consequently more expensive prices. Phone or mail me! One of the longer cohorns I have made. It is about 80 cm long. 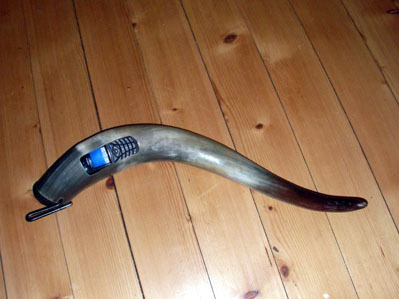 The tip is saved, with an end plug, so the horn is useful for drinking if you are thirsty. A small bunch of horns set for documentation. 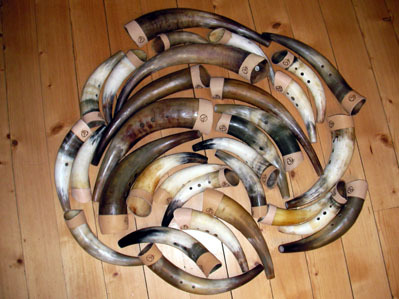 When I have been working with cowhorn making for about 40 years, there are countless horns passing through my workshop. I make horns from about 20 cm to about 80 cm. You can get horns in "normal" tuned keyes, but most do are in "cow-minor"